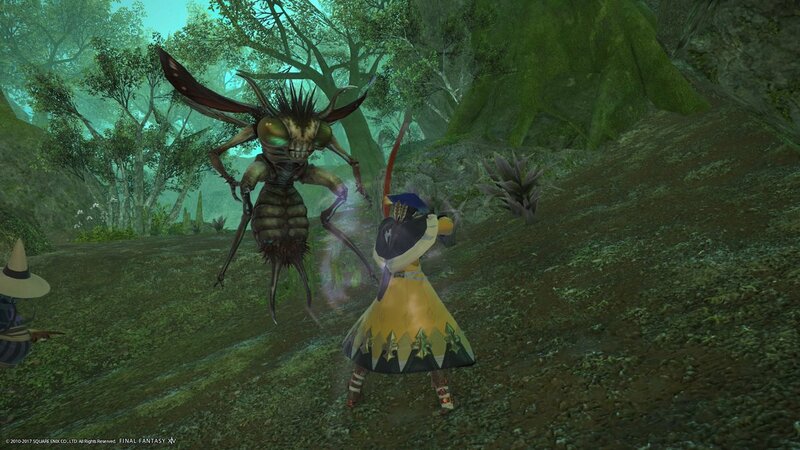 On June 20, the next major expansion for Final Fantasy XIV: A Realm Reborn is set to be released. Titled Stormblood, it will be the first major expansion since last year’s Heavensward, and will add a great deal of new content into the game, including a new character job (Red Mage! Yes! ), underwater areas (you can finally go swimming, giving those bikinis I love dressing my character in a point to having them), a new beast tribe to interact with, and new high-level and alliance raids. 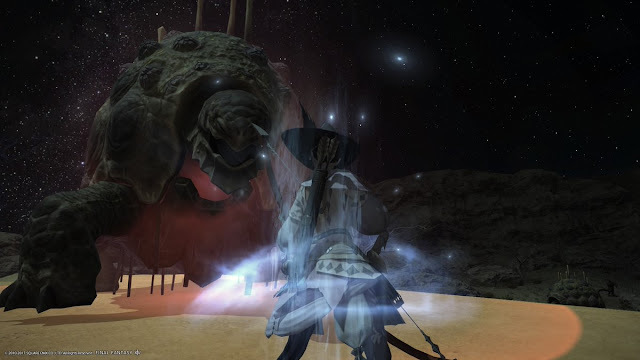 Related reading: Matt's review of the previous expansion to Final Fantasy XIV: Heavensward. 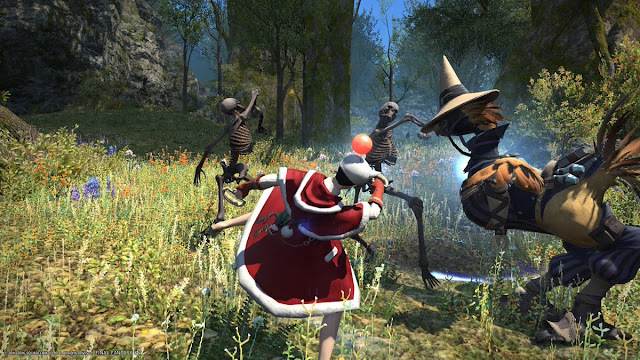 In addition to the smaller additions and refinements that have been made to the game over the past year, now is a good time for players to get back into the game, so they can catch themselves up before Stormblood lands. I’ve jumped back in and spent a dozen or so hours re-acquainting myself with Final Fantasy XIV, and was instantly reminded of why I love this game so much. Though I’ve dropped in and out of it over the months, the overall play time that I’ve spent living in Eorzea is now in the weeks, and I’m not even close to experiencing everything that the game has to offer. I got lucky in my timing to jump back in, as there has been a couple of seasonal events going on. I was able to pick up this rather fetching Santa costume by completing a couple of limited-time quests. It’s more a vanity prize than something you’ll be able to wear into the game’s battles, as its stats are quite low, but it has been fun watching a bunch of players running around dressed in these costumes. 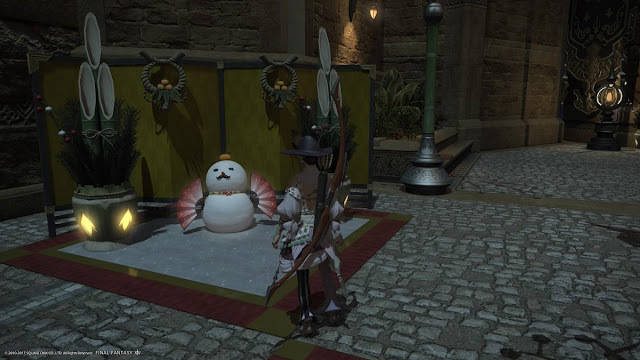 I’ve also been able to purchase a couple of special New Year’s objects, and the festive spirit has been alive and well in the game’s towns, which all have snowmen and decorations scattered around. I’ve also used the time to finally complete the series of quests that I needed to to take my archer character and get her the bard specialisation. For whatever reason I hadn’t bothered with these quests previously, but each base character class has a specialisation that they can acquire that gives them access to additional abilities. In the bard’s case it’s a series of songs that they can perform to either boost their allies or debuff enemies in battle. It helps make the bard a more versatile team player, and I look forward to testing out her new abilities in a major boss battle or dungeon. I say that I’m “looking forward” to these things because the game’s community has finally dwindled to the point where actually organising parties for these things is becoming difficult. That or there’s just so many dungeons and boss battles to complete now that the audience has been spread too thin, and I’m stuck waiting for enough people to sign up for unpopular dungeons. I can’t actually further my own quest until I finally get lucky with this, and while it’s possible to “register interest” in a dungeon and then go and do other things while you wait for enough other people to join in, the average wait times quoted by the matchmaking system are typically up around the 30 minute mark, and I’m sat waiting for one for almost an hour at one point with no luck. It's not the end of the world; it's given me the excuse to participate in the seasonal events, as well as complete some of the seemingly-endless sidequest that I'd avoided in the past, but at the same time I really would like to get on with getting everything I really needed done in time for the expansion. One hopes that as the expansion’s release gets closer and closer more people step back into the game and are at a similar point as I am, needing to complete the same series of quests. I do have to note that I see plenty of people around as I play, so it’s not that the game is feeling underpopulated or anything like that. It’s just that there now seems to be so much to do that everyone’s off doing their own thing, and those things will less frequently align with what you’re doing. Every time I step back into Final Fantasy XIV I am reminded of just how beautiful the game is. In addition to offering an absolutely massive world that covers every kind of exotic setting you could imagine, the level of detail in the environments and characters is incredible, and the fireworks through battles are spectacular. This is still, as far as I’m concerned, one of the best looking games out there. My avatar is also particularly gorgeous. 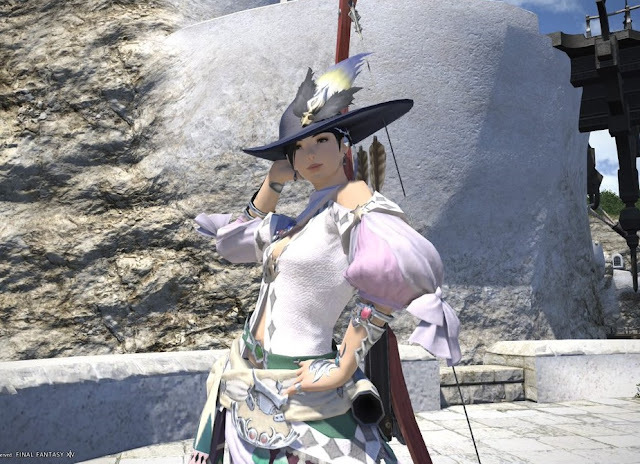 I might not have had a chance to really take advantage of her new bard abilities yet, but another reward for obtaining the class is a really fetching set of bard armour, and I’ve fallen in love with her all over again. Related reading: Our interview with Naoki Yoshida, the producer of Final Fantasy XIV. 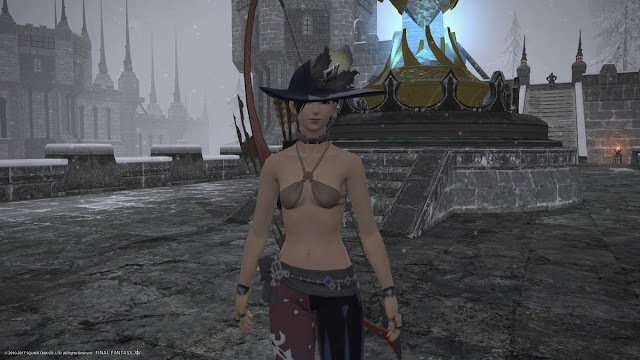 I don’t understand why people overlook Final Fantasy XIV in their discussions of the Final Fantasy series. It almost never ranks among the top games in the series. That’s a pity. Final Fantasy XIV is very much a Final Fantasy game. Despite the MMO elements, the game features enemies, plot hooks and musical themes that are vintage Final Fantasy, and even the flow of combat is reminiscent of the series, if you’ve played games from the ATB era (Final Fantasy IV) onwards. I have to wonder if there are still people out there that are fans of JRPGs and Final Fantasy that have avoided this one because it is an MMO. I really recommend that if you’re one of those people, grab a copy and get into it. I’m not an MMO fan by any means, but the reason I love this one so is that it very rarely feels like an MMO.